of them have actually been correct this year. For real. My two 5Ks this year have both been short (Throo the Zoo was 2.98 miles and the Anthem (sorry, friends…a short course does not a PR make) was 2.96 miles), but my 10Ks have all been measured properly. 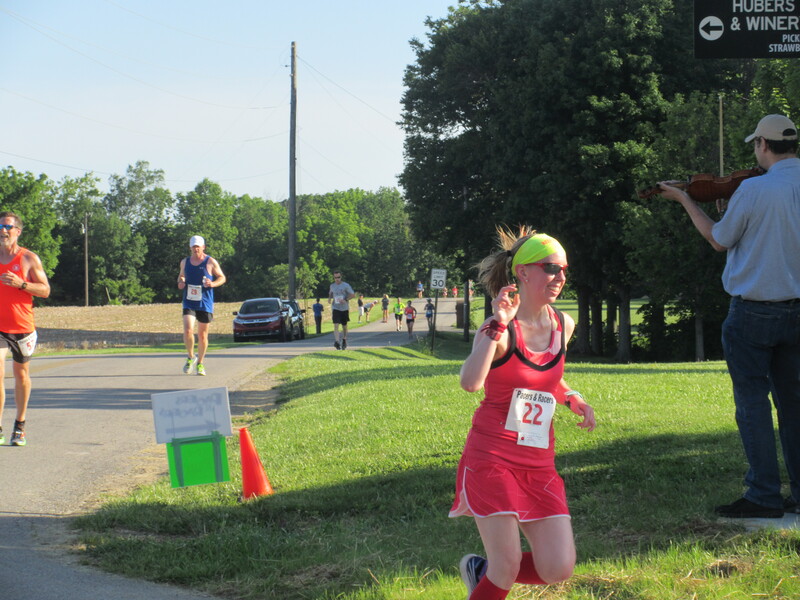 Because the Barnyard Dash 10K…was just slightly short. Slightly. As in I crossed the finish line at 6.14 miles. So, closer to the actual distance than the 5Ks this year…but not an exact measure. For the third time in my local racing this year. I registered. I wore a bib. I toed the line with everyone else. I ran the course. I battled the heat. I hit the hills. 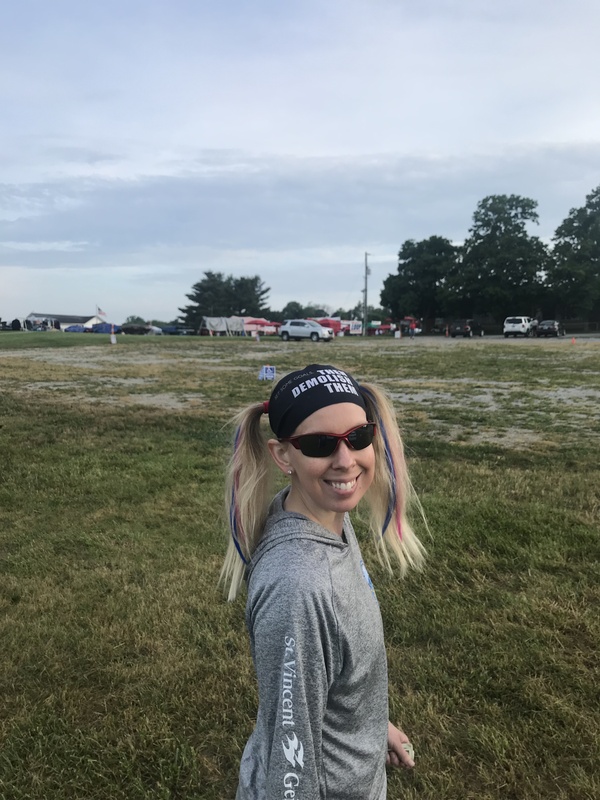 I walked two water stops (yep…I did! )…because while this was a race, I had a longer run on the table and I needed to conserve my energy for that. 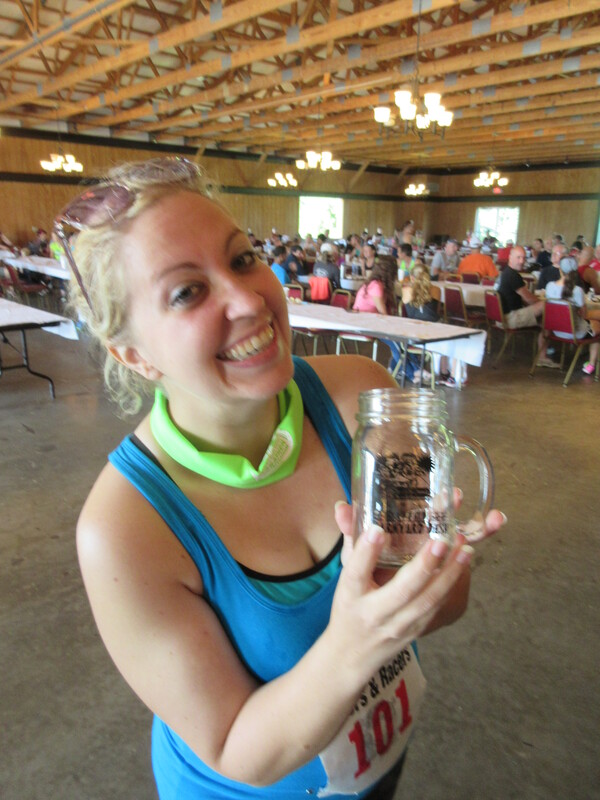 So, yes…I ran the Barnyard Dash 10K, but I wasn’t doing it to set any new PR or place in my age division. I was doing it to break up mileage and enjoy some of it with a group of people on a (mostly) closed course. I love helping my friends…which is why I am completely serious when I say that I will run with anyone. I can back off my pace anytime if it means company for the haul. 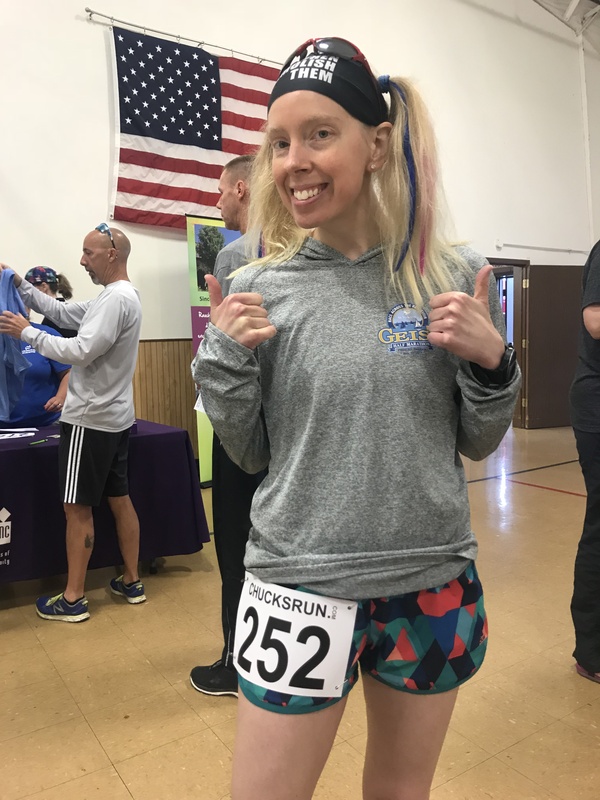 And, with the myriad of injuries I’ve had the past two years…and those that still linger every now and again…backing off my pace while training is not just something I say I’m going to do…I actually do it. My friend, Matthew, was needing a 19 miler this particular Saturday. 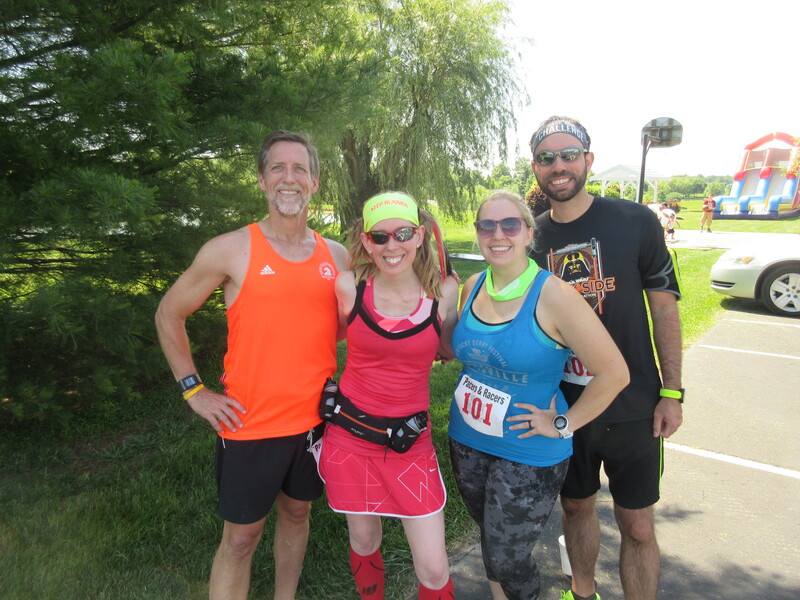 We decided to meet at Huber’s early so we could get a couple in before the race…then run (not race) the 10K…and then finish off the remaining miles after the race. It was going to get warm pretty fast that day, so if we could do some before the 8 am race start, we were going to do so. We managed to get in 2 miles before the race as we both had to go get our bibs and timing chips to tie onto our shoes. The morning temps were humid, but I was still chilled (my body temps are always so weird), so I decided against just doing the bra top (in addition to my own dislike of how my core and body currently look) due to the fact that I was still cold. But that didn’t last long. Nope. Not at all. I ran to use the (flushing) bathrooms just prior to the race. There was a line. Of course. So, I stood in it patiently, listening to the announcer give the minutes that remained before the race. As I moved up in line, I spotted Melissa at the hand towels and gave her a wave. She said she’ d catch me outside. And that happened…because Cathy waved her down and had her stand there. HA! 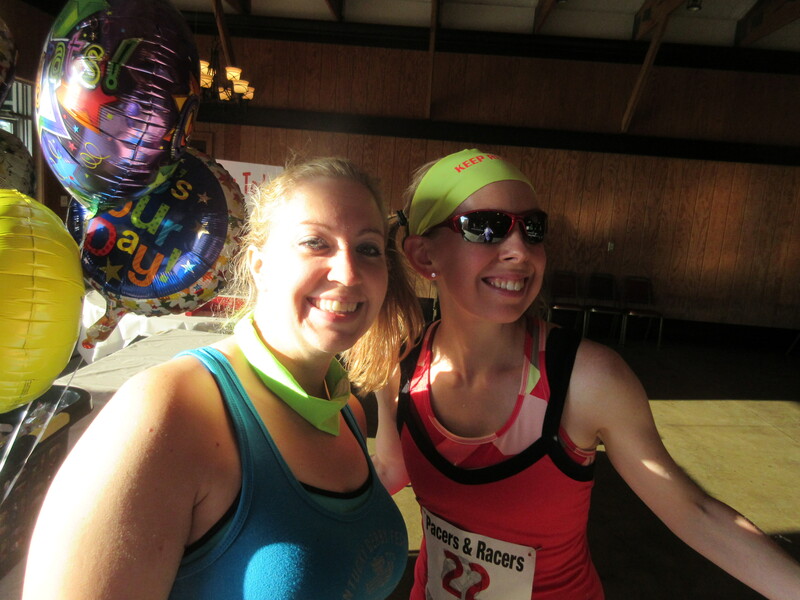 We took a picture and then made the trek to the start line together. Matthew had already lined up…so I gave Melissa a hug, wished her luck, and went to go find Matt. We had both decided to “jog” this race and were going to pretty much stick together. He waved me down, having lined up with our friend Dennis (Mister Fly & Die himself! ), who said that he was just going to “jog ” this one as well. So…we set off. Dennis pulled ahead immediately, and Matt and I settled into a comfortable pace that allowed him to point out landmarks, homes, and tell some great stories…as this was the area he grew up in. Nothing like a running guided tour. It was great. This race can be really, really deceiving if you’ve never run it before. I had not; however, Matthew has multiple times. 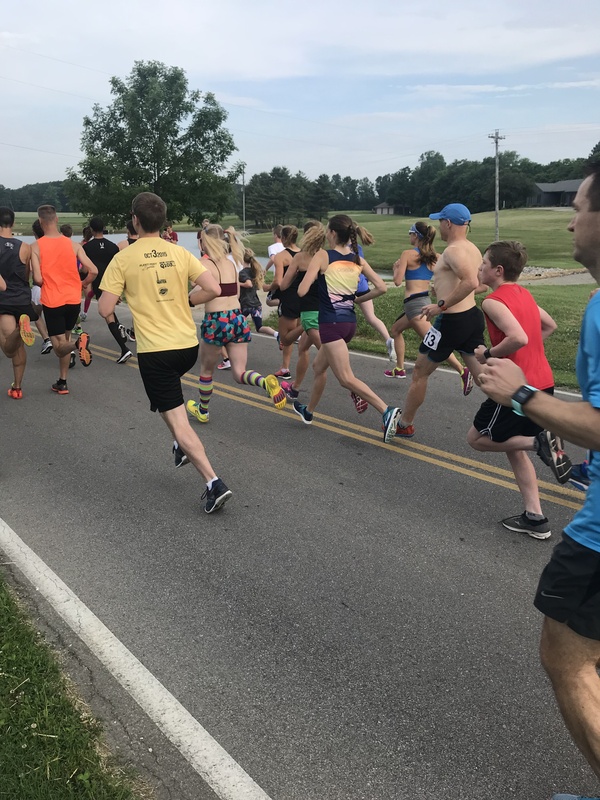 So, with the small rollers to start us off, within the first mile, you get this amazing downhill that lasts for a good portion of those first 2 miles. But after that is where the challenge and difficulty really start to rear their ugly heads. As many of us know…most downhills lead to uphills, and the one that we meet on St. John’s Road was no exception. It is one of those hills that you think you can see the top, and then it just keeps going. In this case, it turns a corner…onto Rake Road…and continues to climb. You do eventually get a small downhill only to be sent back up a hill. And the remaining 3 miles play out like that…rolling up and down. And in the heat, those uphills seem even more brutal, let me tell you! At the Mile 3 water stop, I gladly accepted a little mini bottle of water. I cracked it while slowing my pace to an actual jog and took a drink. The rest of it went straight over my head. It felt amazing and, as it usually does, rejuvenated me. Dennis was walking this water stop and I paused long enough to set the bottle down on the side of the road (we were beyond where people were picking up trash at that point and I didn’t want to just toss it aside never to be seen again) and Matthew and I started to pick it up again, just as Dennis did. And we never quite got ahead of him there. Between miles 3 and 4…I did get slightly ahead of Matthew. My pace felt good though…so I let it hold for the time. Cathy had wandered down to the intersection near Mile 4, and was cheering and shouting for everyone. I heard her tell Matt to hurry up and catch me. I knew he was right behind me. I was just taking my time…and feeling good. 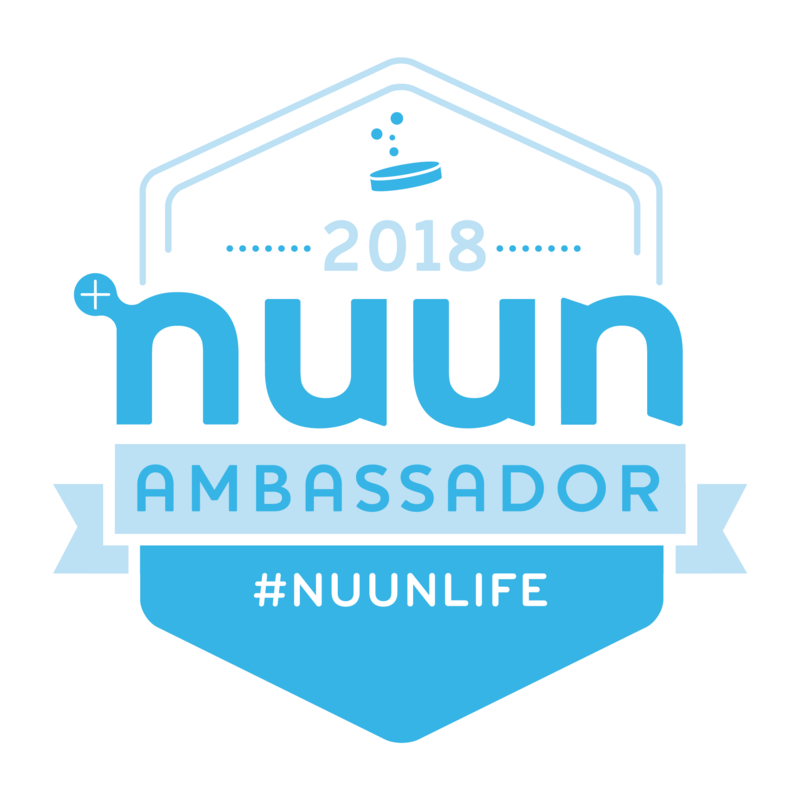 The other water stop was at Mile 5…and I snagged another bottle of water to perform the same actions as with the first – crack it open and take a sip before pouring it over my head. The only difference was…I stopped to walk this one this time. Once the bottle was empty and I placed it in a box that a volunteer was holding, I picked it up again…and passed Dennis in the process. I was only a mile from being done and still felt decent enough. 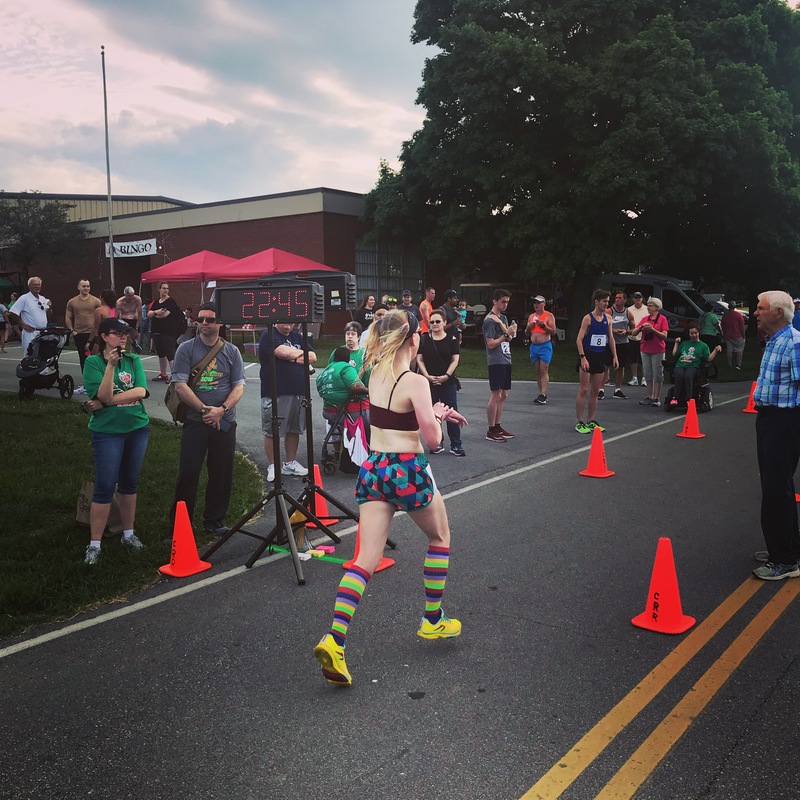 But this is where we hit the elusive Hill Road that I mention every time I run the Strawberry Festival (Run for the Berries 5K) race. You know when the hill has a road named after it…it’s a freakin’ hill! I was feeling the heat and humidity, but I still managed to power myself up the steep hill and breathed a sigh of relief as my legs found some level ground and had to rework how to run on it. You know you’ve run hills when your legs get confused by flat road. From there, it was just a matter of turning a corner and then bringing it home. The mileage almost caught up to itself. But, I made the turn back into Huber’s Family Farm and immediately was greeted by the smell of fried food. I almost threw up. But I swallowed hard, attempted to breathe without breathing, and ran it in to the finish line! Only a short distance behind me was Dennis and then Matthew. We snagged some water and ducked in out of the sun for a moment. There was an amazing spread of goods waiting for runners. Mandarin oranges, strawberries, bagels (with either cream cheese or peanut butter), bananas…and the fountain machines were open to runners as well. I snagged an orange and some strawberries, downed more water, and then went to use the bathroom. Matthew and I still had miles to go before we could call it done. Cathy passed me my fuel belt and went back out to cheer on Melissa and Paul. Matthew and I decided to be those people who run the course backwards. At least the last part of it. Matthew, as I mentioned, grew up in Starlight, Indiana, and I was in for the tour of a lifetime. We turned back onto Hill Road, and ran into Howard, Melissa, Paul and Terry. All the peeps I didn’t get to see back at the finish line. Cathy said she and Laura cheered in Melissa and Paul and that’s pretty damn awesome. Cathy was invited to hang for the awards and Matthew and I did the rest of our run. It was a humid day and we were on the hills of Starlight. There is no shoulder on these roads and a TON of blind curves. So, we took our time for our safety and for training (you don’t do long runs at your race pace!) and had a lot of fun as we talked and I was given the stories and grand tour of the area. The miles flew by. And just as we rounded back into Huber’s Family Farm…the awards were just letting out. Friends don’t let friends miss out on age group awards! Melissa picked mine up for me! Apparently the guy who gives out the awards in quite the talker. And, we spotted Dennis, Tammy, Dean, Howard and Terry, all with awards. And Dennis mentioned that I had gotten one too. That shocked me. Because I wasn’t even trying in this one. No expectations. Nothing. I came in 2nd in my age group. I came in 10 minutes slower than the person who took first. That would be April Woo. I’m never winning my age group this year, LOL! After Matthew and I rounded out our mileage in the parking lot, Cathy and I joined Melissa and Paul at Huber’s Winery. No wine, but I got a plain baked potato for lunch and downed a big chunk of water. I also trained out of my sweaty running clothes so I almost felt human again. HA! 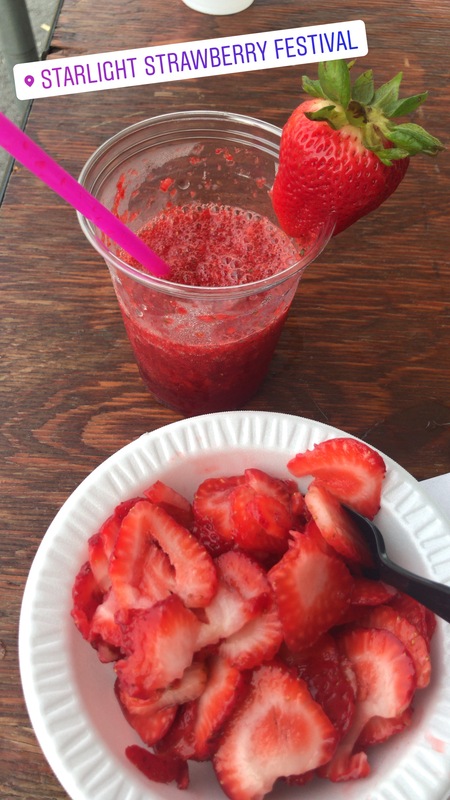 Afterwards, we bought 2 gallons worth of local, fresh strawberries. And that was just the start of the weekend. 2 mile warm up…10K…and 11 more miles…DONE! Just a fun run on a Saturday. 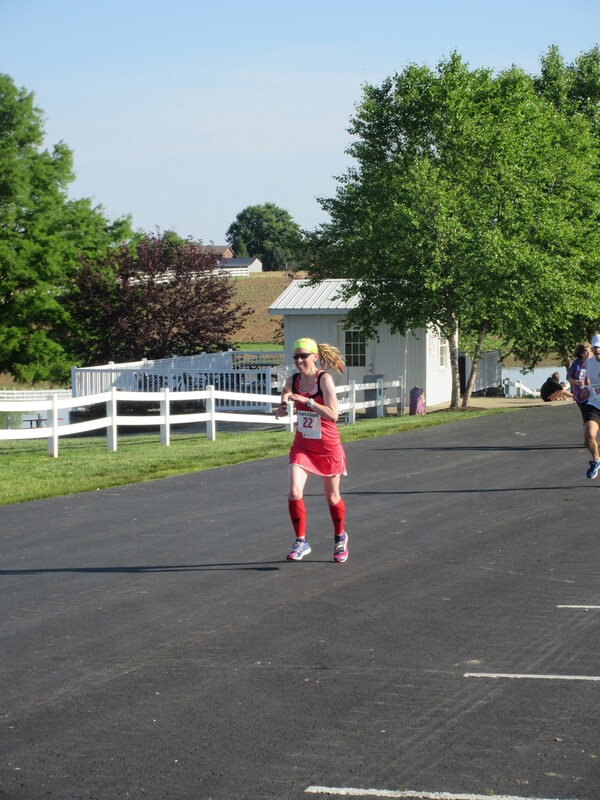 So…the official results of the Barnyard Dash 10K are that I finished in 48:48.,,in heat and on massive hills. Without even putting effort into it. 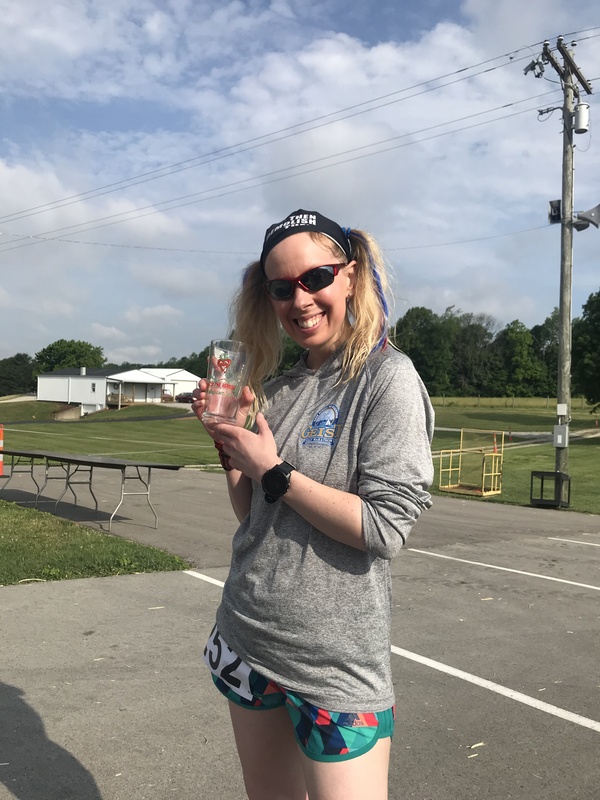 I was only 8 seconds off of this year’s Rodes City Run (which I wasn’t racing either…but that’s mostly flat…so this is a win!) 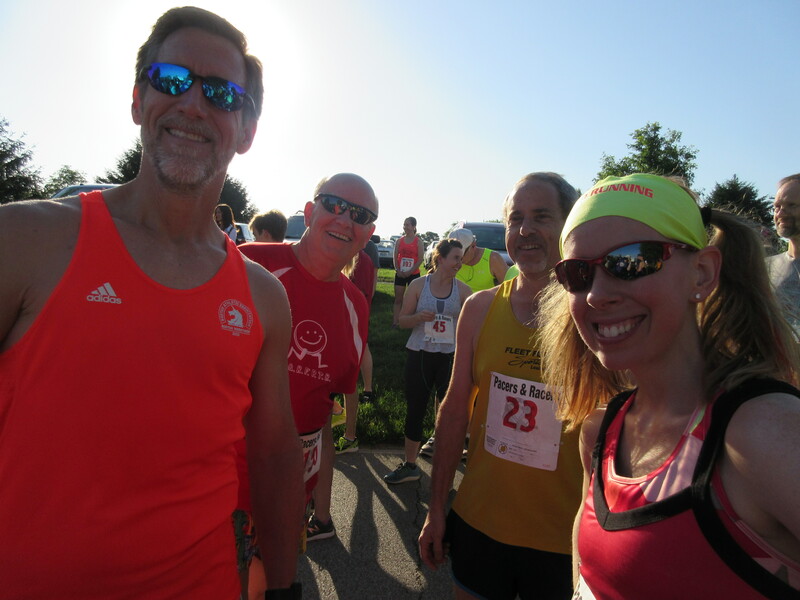 There is something very relaxing and calming about running in a race without competing. Seriously! I was 56/181 finishers overall. 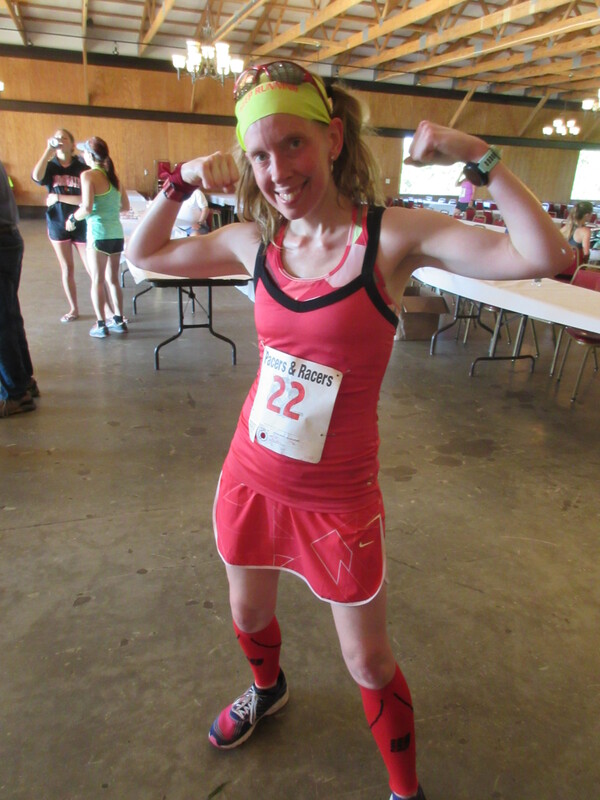 I was the 14/91 for women finishers. And I was 2/14 in my age division. This was totally unexpected. I knew this race was brutal with the hills and heat (it’s usually either raining or hot, apparently)…but now I know just how much. I was happy to round off the day with a little more in the tank to get the rest of the miles in. I might revisit this one next year and race it for real.